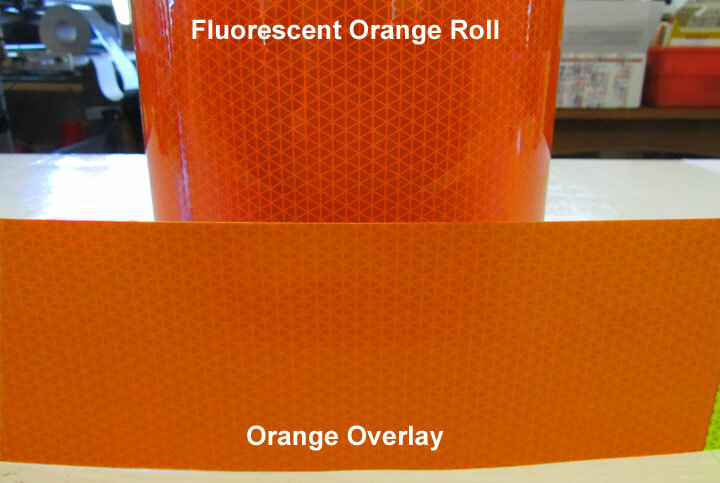 This is an informational article explaining the difference between orange that is created on a lime or white panel using an orange overlay versus fluorescent orange rolls. 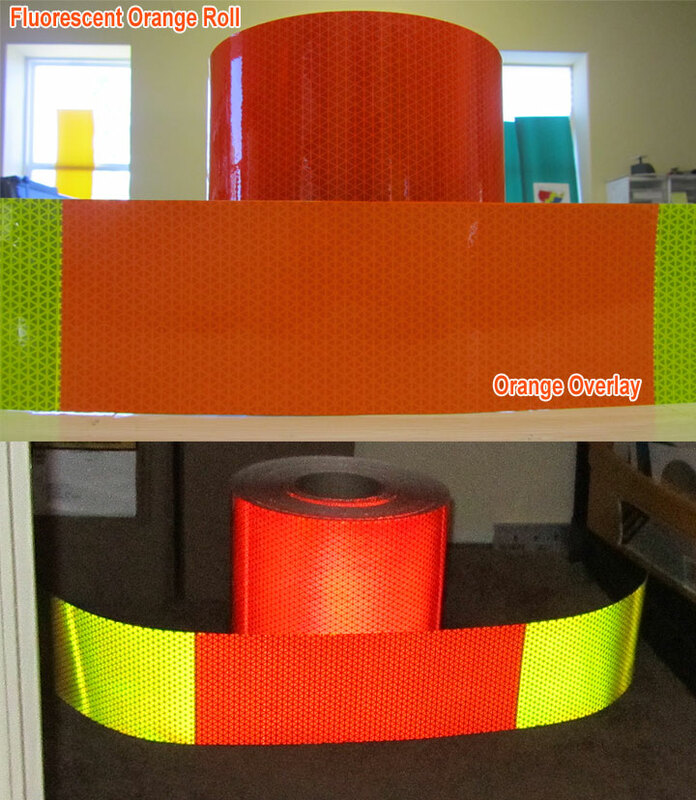 When we make lime or white and orange reflective chevron panels or non slanting reflective panels we use an orange overlay to create the contrasting orange stripes. The orange overlay is a transparent orange film that changes the lime into orange. Very simple. We also have rolls of fluorescent orange. The orange that we create with the overlay is nice and bright and makes a great contrasting color to go with the fluorescent. However, it is not the same shade as the rolls of true fluorescent orange. The pictures below are the best way to show the difference. As you can see, both colors are nice and vivid but there is a difference in shade. The fluorescent orange roll is going to be a little richer. The picture below shows the material in standard light and with a flash camera. They both reflect about the same. The picture below is of an order of orange and lime panels we created. They give you an idea of how the panels will look when you receive them. Red and Fluorescent Lime panels are the most popular. Orange and Fluorescent Lime panels are the second most popular. 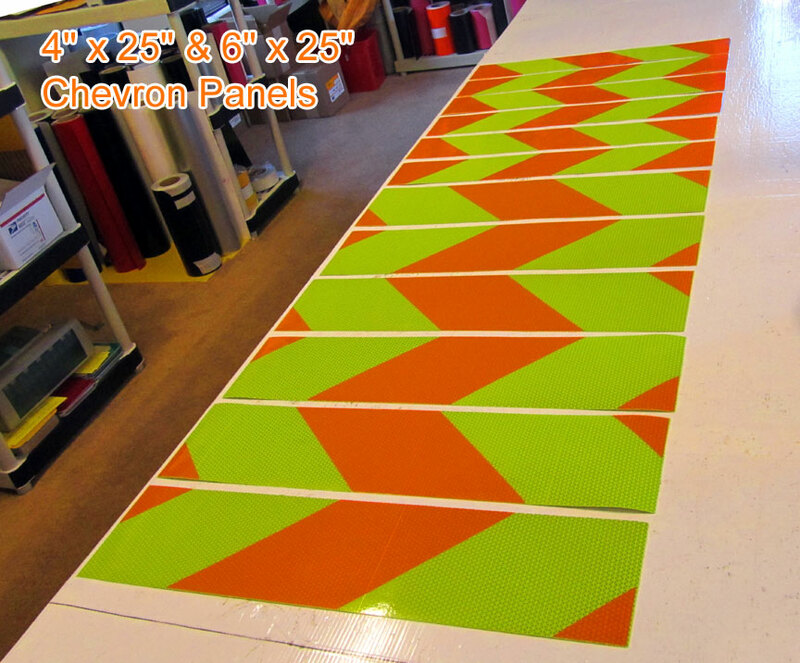 Our chevron panels can be found at www.chevronpanels.com .